A creamy potato, carrot, and pickle salad that is the taste of Russian holidays. I don’t know what you’ll be doing on NewYear’s Eve: probably getting your nails done and your hair blown out in preparation for a glitzy evening. Me? I’ll be up to my elbows in mayonnaise, making Salad Olivier, without which, 2018 will not turn into 2019. The classic Soviet New Year’s menu is as resistant to change as the current regime. It all hinges on two mandatory, incredibly labor-intensive, mayonnaise-based cold salads: Salad Olivier and Herring Under Fur Coat. While baffling in their appeal to any but the Russian tongue, these nevertheless take pride of place on the festive board, alongside other zakuska: smoked meats, salted and smoked fish, caviar, and marinated and pickled vegetables. In one of the opening scenes of the iconic Russian holiday film “The Irony of Fate,” the hero Zhenya’s mother resignedly dices potatoes and carrots for Salad Olivier, a heavy, stodgy potato salad made with tinned peas, diced carrots, canned ham, and way, way, way too much mayonnaise. She comments, in that long-suffering Orthodox Christian martyr manner Russian mothers-in-law have perfected down the ages, that Zhenya’s girlfriend, Galya, appears to be too busy to make the traditional New Year’s Menu for him, telling us all we need to know about Galya. When a series of comical events forces Zhenya to spend New Year’s Eve with a different woman, Nadya, he drunkenly offers a very disparaging critique of her salads. And from this, we understand that Zhenya and Nadya’s long (like really, really long) process of falling in love has hit (yet another) speed bump in their (really, really, really long) journey to Happily Ever After. 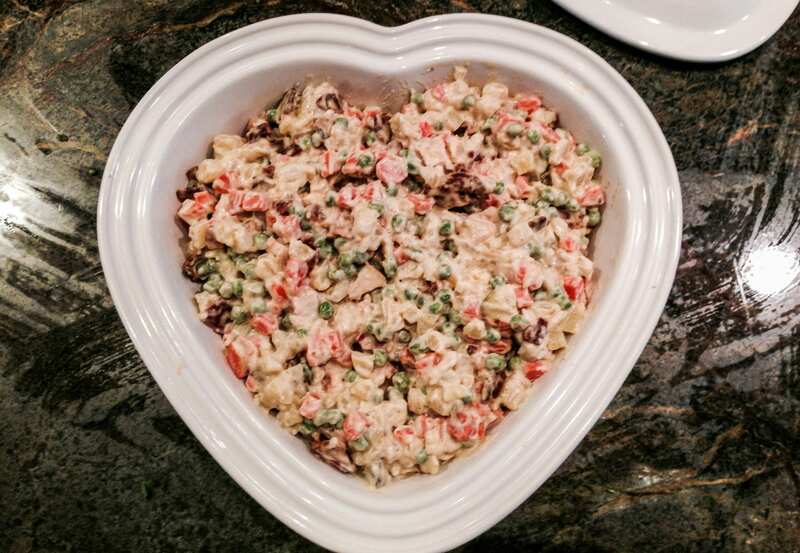 The message of “Irony of Fate” is abundantly clear: if you want to get to Happily Ever After with your own romantic hero, then you too must master the art of the Russian New Year’s salad. And I’ve spent about two decades doing just that, which is why I now feel entitled to exercise a teeny tiny bit of poetic license. Learn more about great Russian Films with Jennifer's Top Ten! 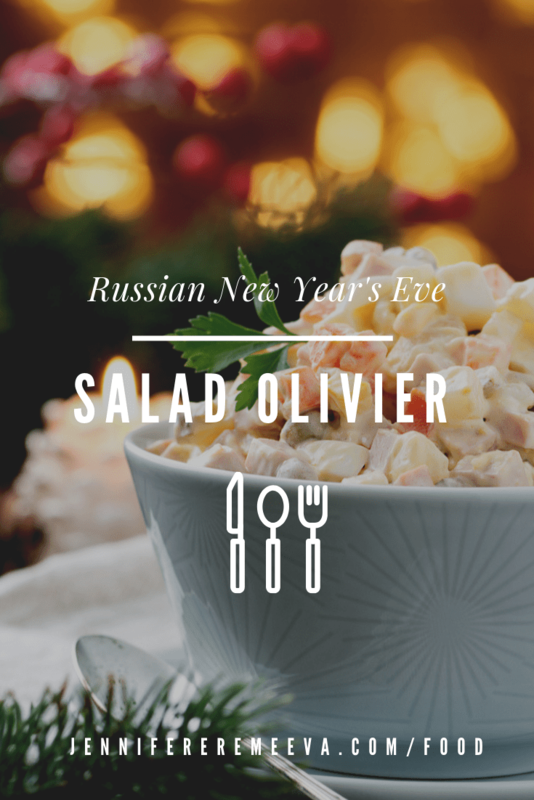 Salad Olivier is the sine qua non of the New Year’s menu everyone knows that; as much as I would love to divide the ingredients into separate and far more appetizing far like minted peas and roasted carrots alongside a creamy Dauphinoise potatoes, that isn’t going to fly. But there is nothing in the unwritten playbook which prevents me from reverting to the original, pre-revolutionary recipe of Olivier, which is as much like the Soviet version as the Orient Express is to Metro North. The renowned Belgian chef, M. Olivier invented the salad that bears a version of his name in the late Nineteenth Century for an upscale Moscow restaurant. As soon as it debuted, it was an instant hit with the restaurant’s tony patrons, largely thanks to the secret sauce, which Olivier guarded jealously throughout his life and ultimately took to his grave. We know, however, from enthusiastic contemporary accounts that it was subtly tart, velvety smooth, and slightly spicy. Several nineteenth-century cookbook writers attempted to recreate the recipe, listing all manner of interesting ingredients such as grouse and crayfish, which, let’s agree, are far more intriguing than bland, tinned ham. It was the word “aspic,” in a recipe by P.P. Alexandrova-Ignatieva, in her 1909 cookbook The Practical Basics of the Culinary Arts that got me excited. 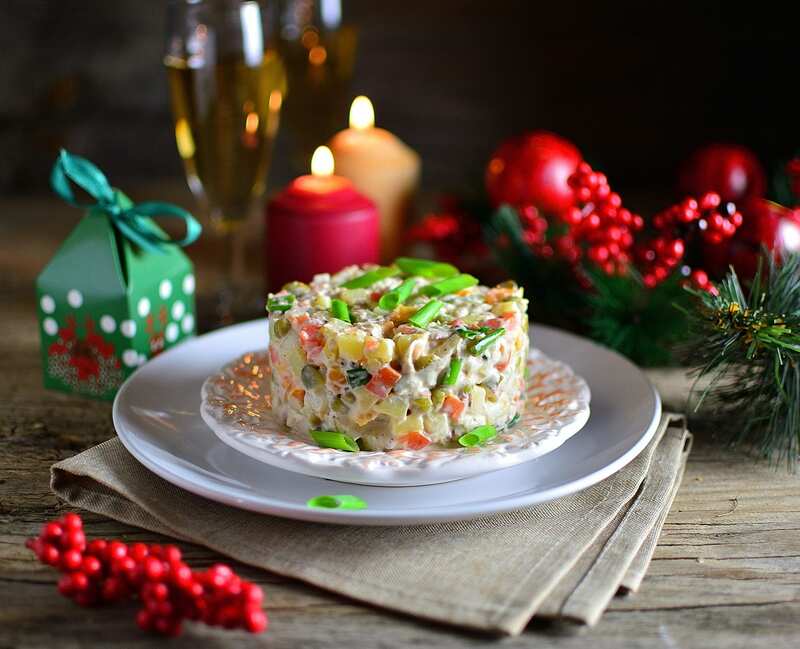 Both mayonnaise and aspic arrived in Russia with the European chefs, who made elaborate decorative dishes of game and fish molded into their original shapes, coated with aspic. These dishes served in the smart salons and banqueting halls of the Russian nobility were usually served decorated with Sauce Provençal or mayonnaise. Mayonnaise and aspic marched through late Imperial Russian cuisine like twin warriors. Alexandrova-Ignatieva’s cue that Salad Olivier contained “cubed” aspic inspired me to try and rescue Salad Olivier. Several years of experimentation have yielded the following recipe that uses the lightest of mayonnaises, spiked with mashed capers and a lot of lemon juice to both lighten up and boost flavor. Cubes of aspic made from chicken stock, Madeira, and gelatin provide a subtle gamey taste, which compliments duck confit and bacon as the main meat component. My version of Salad Olivier is no less time consuming than the Soviet version and some readers have raised their eyebrows at the seemingly unnecessary step of adding gelatin cubes, but trust me, it really elevates this stodge into something very special: even HRH admits that this he prefers this version to any other. Proof the gelatin with 1 cup of cold chicken stock. Bring the remaining chicken stock, Madeira, and Tabasco to a simmer. Add the mixture to the proofed gelatin and cool to room temperature, stirring frequently. Pour the cooled gelatin into the rimmed baking sheet and chill overnight. Boil the potatoes, unpeeled until the point of a knife slides in with ease. Do not overcook them — you want them to keep their shape. Chill them for at least 2 hours, then peel and cut them into a fine dice. Dice the carrots then toss them with olive oil and sprinkle them with salt. Roast them for 15 minutes in a 450ºF/220ºC oven. Let cool completely. Plunge the frozen peas into a small saucepan of rapidly boiling, salted water. Let simmer for 1-2 minutes. Drain, then immerse in a small bowl with ice water. This will help stop them cooking and retain their brilliant bright color. Fry the bacon lardons/pancetta until the fat is rendered. Remove to a plate covered with a paper towel to drain. You can prepare these ingredients 1-2 days before, keeping them in the refrigerator in a non-reactive bowl covered with plastic wrap. Combine the garlic cloves, anchovy fillet, mustard, lemon zest, capers, and shallot with one tsp. of salt in a food processor fitted with a steel blade. Pulse to combine into a rough paste. Add the egg yolks, then slowly add the olive oil in a fine drizzle until the mixture thickens. Taste and adjust seasoning with Tabasco, salt and pepper. Chill for at least 3 hours to allow the flavors to combine and bloom and the texture to thicken. Decant the cornichons from their jar, drain well and cut into cubes. Toss the salad ingredients lightly with approximately three-quarters of the sauce. Taste to adjust seasoning with salt and pepper and perhaps a bit more sauce. The sauce should lightly coat the ingredients, not drown them. Remove the aspic from the refrigerator and gently slice into small cubes. Don’t worry if these don’t hold their shape — the taste is the main thing. Return to the refrigerator until you are ready to serve. As gently as you can, fold the gelatin cubes into the salad. My preferred method for serving Salad Olivier is to scoop small amounts into pastry cups, individual china ramekins, small ceramic serving spoons, or in small shot glasses. The presentation looks better than a massive mound of potato salad, and single servings won’t slip and slide as much as the evening progresses. Of course, when the evening is over, all bets are off, and the dish reverts to the comfort food/hangover blotting paper it’s meant to be! Duck Confit and Pancetta can be hard to find, but the search is worth it. I get mine online from D'Artagnan. Subscribe to receive updates when posts like this are published. Thank you for visiting and enjoying another delicious food post! If you make this recipe and post to Instagram, use the hashtag #cookingwithjennifer so I’ll be sure to see it ! This recipe first appeared in an article for The Moscow Times on December 29, 2017 and a link to the full article may be found here. The Irony of Fate is available to watch with English subtitles on Amazon Prime. This post contains affiliate links and ads. Any purchases you choose to make via these links will net me a small commission from the retailer. I use these funds to support the maintenance and development of this website. Title photograph by nelea33 via Shutterstock.